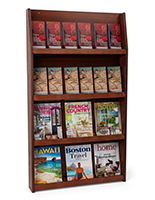 This wall mounted magazine rack is constructed with solid oak with a mahogany finish. Each literature holder features nine pockets with a clear acrylic front panel. 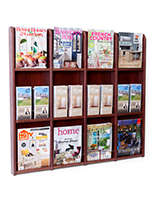 The wall mounted magazine rack has removable pocket separators. This unique design allows users to configure this flyer organizer as needed. 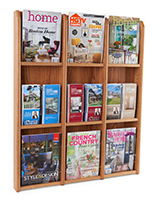 This wall mounted magazine rack can hold up to 9 different catalogs or 18 standard sized brochures. The acrylic panel allows for a complete view of each pocket, and keeps the contents securely in place. 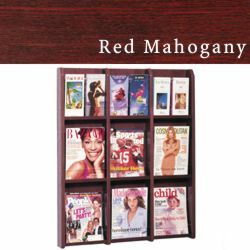 This wall mounted magazine rack with a mahogany finish is an efficient method of offering reading material in a waiting room or reception area. Hang this literature holder in a busy office to encourage clients and guests to keep the office looking neat and organized. 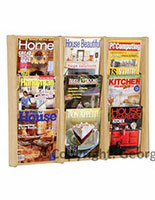 This wall mounted magazine rack ships completely assembled; ready to use right out of the box. 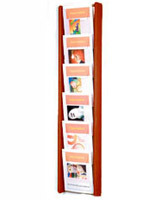 Hanging this literature holder is fairly simple, and can be completed in a matter of minutes. 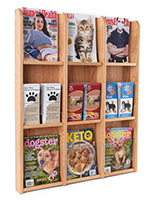 Place this wall mounted magazine rack in a medical office to allow patients to take informational pamphlets and other reading materials. Guests will appreciate the gesture. 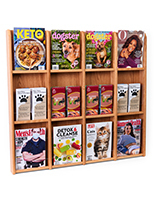 This wall mounted magazine rack, also called a literature organizer, is just one of several options offered within this series. Choose from light and medium oak units in various pocket configurations. 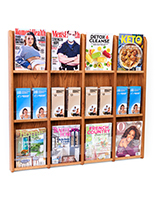 This wall mounted magazine rack is an efficient literature holder that complements the other wooden fixtures within an office.